Colorado Department of Labor & Employment Approved Training Provider since 2002! Offering HANDS-ON Certified Training for 15 years in the Denver Metro Area! The 2017 training costs per participant for the Forklift Certification ($150), and Flagger Certification ($75) are set! We are proud to offer the general public, employers/agencies we work with affordable and flexible training opportunities. PLEASE NOTE: MULTIPLE FORKLIFT TRAINING SESSIONS THIS MONTH! Now offered Monday-Friday and two on Saturday’s…striving to meet your training needs and requests! Appointments available as well! Our Next Forklift Training Session “open to the public” Will Be At Bud’s Warehouse!!! Train in the Warehouse Environment!!! ***Wednesday April 24th, 2019 (1-day format) beginning at 11am: Forklift Safety and Operation Certification Training. Please note that the Forklift Training will be a “1 day” training format this month beginning on Wednesday 4/24, 11am. GREAT NEWS: Forklift Training is now available by appointment as well! 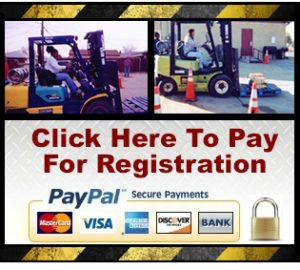 ***Saturday Forklift Training sessions available by APPOINTMENT! We offer appointments 6 days per week at two locations! ***Flagger Saturday April 20th, 2019, 10am: Flagger (Certified Traffic Control Specialist). Now is the time to obtain the Flagger Certification. Street repair, and highway construction projects will continue now that summer has arrived. NOTE: “Flagger” training will be held Saturday 4/24, 10am at: Northeast Church of Christ: 5490 Crown Blvd, Denver CO 80239. Additional “appointment” info: IF THE ABOVE FORKLIFT/FLAGGER TRAINING DATES DO NOT WORK WE WILL ALSO TAKE INDIVIDUAL CLIENTS, BY APPOINTMENT, THIS MONTH FOR THE FORKLIFT & FLAGGER TRAINING (Cash, card, or money order appointments only) Please Call 720-334-6424 to schedule or for more info.